I have been closely following the gold/silver ratio as it cascades lower in 2011. For me it's another barometer of risk in the system - or lack there of. Basic thesis being that the silver market speculates with greater velocity than the gold market during times of exuberance and captures the underlying animal spirits of the marketplace. Of course there's more nuance to the ratio than that - but let's keep it simple stupid (KISS). Some interesting things to consider here. Before the tragic events of last week in Japan and even during the contentious times in the Middle East - the equity markets as well as the gold/silver ratio were trending very similar to the 1997/1998 market. 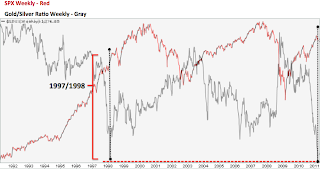 The markets back then were getting themselves into a momentum frenzy until the fat tail of the Asian Currency Crisis set things in motion that eventually cratered the US stock market (albeit short lived) in the summer and fall of 1998. Today we have instability in the major energy complex of the Middle East and a exogenous shock to the worlds third largest economy. 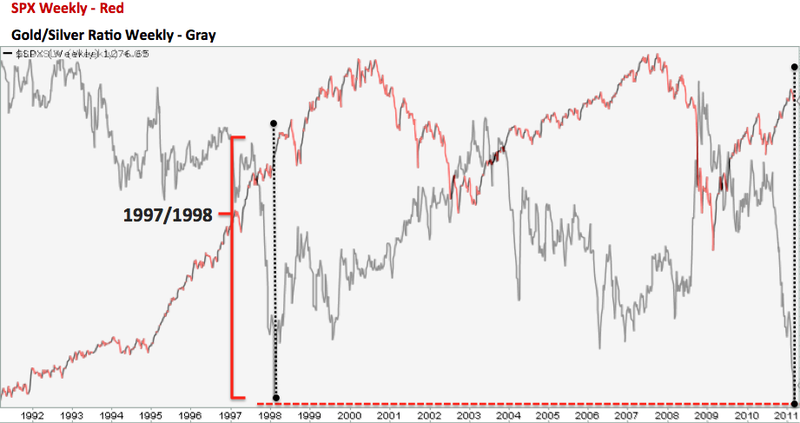 The tail risk from this crisis at the moment appears much greater than in 1997 & 1998. •The Japanese equity markets were perceived before the disaster as undervalued with relative value to risk metrics. For this reason alone it is quite likely that leveraged funds were heavily invested in Japan as either a hedge on their primary investments or as a primary investment thesis itself. Considering the Nikkei's greater than 20% decline in the past week, the collateral damage to world markets is just being felt today or will likely not surface for many months (see 1998). •The Yen carry trade is unwinding with great velocity. Considering it was one of the cheapest recurring sources of funding speculative assets - it has broad implications to liquidity within the global financial system. With that said, there can be a significant lag in any downside fallout to the broader trend, especially if the market was strongly trending higher with high relative strength - as exemplified in 1998.